Over the past decade, women’s mixed martial arts rose from relative obscurity to noticeable heights that many could not fathom in such a short span of time. Despite the rise to prominence of female competitors from different parts of the globe, many households in Asia still keep a conservative stance in viewing women as part of the constantly-evolving sport. When Priscilla Hertati Lumban Gaol tells her friends or neighbors about how she makes a living, she gets more than a few quizzical looks. Some are legitimately thrilled about her professional martial arts career, but many more, like her family members, believe that she should quit. “Some friends are excited. But some just have questions like, ‘When will you stop? It is better to get another job rather than competing, because of your age.’ My family is very concerned for my safety,” she bared. Gaol has been battling negative reputation of women’s participation in combat sports since she started training various striking disciplines such as kickboxing and Wushu at a young age. Even though she brought home pride and glory to her country by becoming an international Wushu champion, the aforementioned undesirable perception had not left her. Directing her career path to mixed martial arts over a year ago, Gaol explained that seeing a woman succeed in a sport wholly dominated by men for the past 25 years is just an example of what is possible. “I would like to continue this campaign for everyone who doesn't understand the beauty of this sport. Martial arts is not about fighting. Its real aim is to empower both men and women. We’ve already seen what women can do inside the cage or ring. It’s a high time to unleash our full potential in this sport,” she asserted. While it has declined inch-by-inch, Gaol pointed out that women’s role in mixed martial arts still needs to be consistently promoted and encouraged for the stigma to totally diminish. “It needs more opportunity. I think that there are young girls who are probably interested in getting into it, and we need support from men and women to encourage and let them go to the gym,” she conveyed. After going through a shaky start in ONE Championship, Gaol is in now making a name as an atomweight contender in the organization. The 29-year-old native of Jakarta, Indonesia has won two-straight matches, defeating Audreylaura Boniface via first-round stoppage last January before submitting Filipina newcomer Krisna Limbaga a month later. “Once I fail, it gives me a different view of myself. It is like a mirror, where I can see clearly about many things, and I think that has made me a stronger person,” Gaol added. 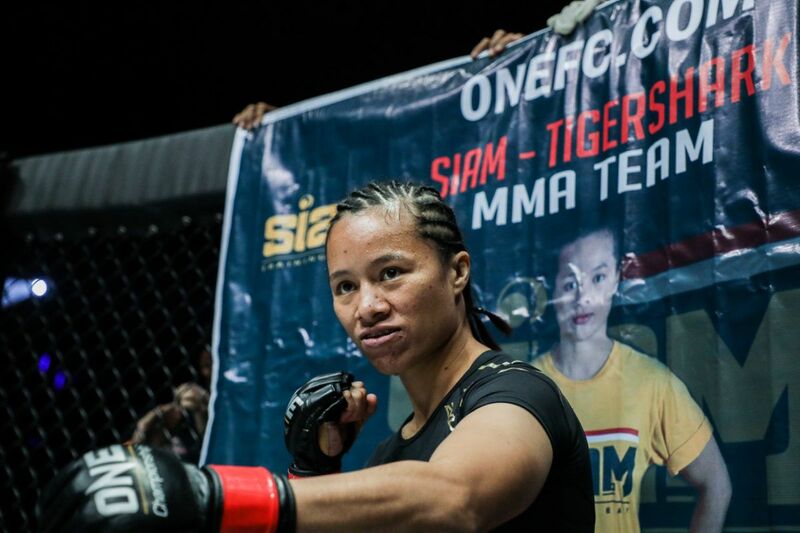 Gaol looks to keep the momentum rolling as she is slated to square off with Filipina standout Rome Trinidad on the undercard of ONE: GRIT AND GLORY, which is set for 12 May at the Jakarta Convention Center in Indonesia. Despite having the momentum going into her next assignment, she remains on her toes to bring her “A” game each and every time she sets foot inside the cage. There is plenty of ambition fueling her grind, including a shot at the coveted ONE Women’s Atomweight World Championship. Although Gaol acknowledges that it will take more time and more experience to achieve her dream, she seeks to exemplify the utmost confidence of a woman on a global stage at ONE: GRIT AND GLORY. “I love it when I defy odds and prove my doubters wrongs. I am here for a reason. Someday, I will be a world champion. And I will use that platform to create more opportunities for women and my countrymen,” she concluded.